Time is money. We understand how important your job is and how valuable your time is. We feel the same way about what we do. 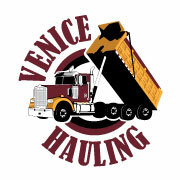 Venice Hauling supplies and delivers construction aggregates and other dry materials, as well as tractor, and dump truck services, safely on time and within schedule. When you need quality materials delivered on time and within budget, give Venice Hauling a call. It’s that easy! We are a family owned and operated Florida business, employing only qualified drivers with experience and clean records. We have two full time, tri-axle dump trucks and as many as you need on call. Venice Hauling drivers are courteous, prompt, and dependable; providing heavy hauling services, throughout South and Mid Florida. We also offer light tractor work such as site clearing, site prep, pool excavation removal, material spreading, and more. Safety – This is our first priority. Our well trained drivers and employees focus on compliance with all applicable government and state regulated safety requirements. Service – Quality of service is what sets us apart from other trucking companies. We strive for excellence in every aspect of serving our customers. We conduct business with the highest ethical standards. Fair Pricing – We constantly find ways to eliminate extra cost and pass these savings onto our customers. We strive to keep expenses to a minimum for both our customers and our company. We look to save money without reducing the quality of our products and service. Give us a call: (941) 275-2940 or (561) 502-5943 and ask for Evelyn. Venice Hauling is your go to aggregate sales and delivery source for all of Mid and South Florida. Family owned and operated, Venice Hauling offers home owners and developers extraordinary service, great products, and low prices.